The Panzerkampfwagen 35(t), commonly shortened to Panzer 35(t) or abbreviated as Pz.Kpfw. 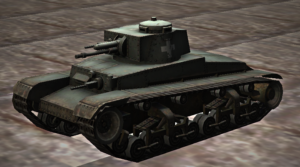 35(t), was a Czechoslovak-designed light tank used mainly by Nazi Germany during World War II. The letter (t) stood for tschechisch (German: “Czech”). In Czechoslovak service, it had the formal designation Lehký tank vzor 35 (Light Tank Model 35), but was commonly referred to as the LT vz. 35 or LT-35. A total of 434 were built; of these, the Germans seized 244 when they occupied Bohemia-Moravia in March 1939 and the Slovaks acquired 52 when they declared independence from Czechoslovakia at the same time. Others were exported to Bulgaria and Romania. In German service, it saw combat during the early years of World War II, notably the invasion of Poland, the Battle of France and the invasion of the Soviet Union before being retired or sold off in 1942. It was used for the remainder of the war by other countries and as a training tank in Bulgaria into the 1950s.